If you use your slow cooker a lot, sooner or later you will find yourself with a cleanup problem when foods get baked onto the inside walls of the cooker. With crockpots, the stoneware insert can be lifted free for hand scrubbing, but this isn't possible with most other slow cookers. Especially as your slow-cooker ages, you may find it more susceptible to baked-on foods that are very difficult to remove. Of course, prevention is the best cure. There are two fairly easy ways you can prevent food from sticking to the inside walls of your slow cooker. First, you can apply a non-stick cooking spray to the inside walls of your slow-cooker before you begin the recipe. Rubbing cooking oil over the inside of the slow cooker has the same effect. This will protect the surface of the cooker from corrosive foods and make the protective finish last longer. Foods will be less likely to stick to the interior of the cooker. Another way to cut down on cleanup time with a slow cooker is by using a liner, such as a Reynolds Slow Cooker Liner. These plastic liners are free of BPA (bisphenol A, a chemical additive found in some plastics) and are approved by the FDA for use in a slow cooker. Line the inside of your slow cooker with liner, and simply remove the liner and discard it after cooking is completed. 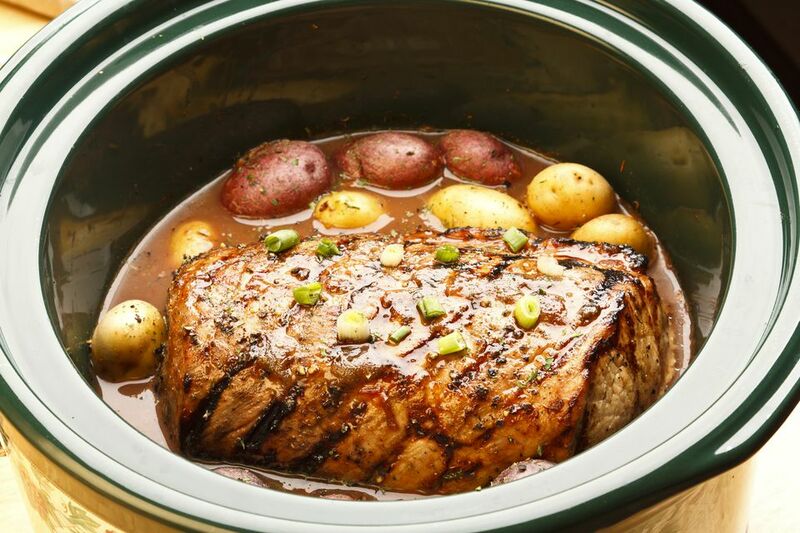 Fill the slow cooker with water and heat for a few hours. Fill the cooker to the top with water, and turn on the cooker to low heat and just let it sit for several hours. The baked-on food will gradually loosen and fall free. Add baking soda. When your slow-cooker insert develops a ring of baked-on food around the inside, fill the slow cooker with water, add a few tablespoons of baking soda and a few drops of dish soap, and heat gently for a couple of hours. Then, dump out the water and scrub the inside with a non-scratch pad. Heat your slow cooker with a mixture of water and vinegar. If your slow cooker develops white mineral stains (most evident with black-enameled crock pots), fill the cooker with water and 1 cup of vinegar, and let it sit overnight. Then wash and dry the pot as usual. The mineral stains should be eliminated, along with any other baked on foods.